Advanced event detection: identifies central sleep apnea, respiratory effort related arousal and Cheyne-Stokes respiration events to provide treating physicians valuable insight into the continued health of your patients. AutoRamp™: with sleep onset detection delivers a low pressure to help patients fall asleep with ease. Once the patient is asleep, it comfortably ramps up the pressure to the prescribed level. The quiet Easy-Breathe motor: makes for a peaceful environment for the patient and their bed partner. Expiratory pressure relief: (EPR™) maintains the optimal treatment for the patient during inhalation and reduces pressure during exhalation. SmartStart™: allows the patient to start therapy by breathing in, instead of pressing the ‘Start’ button. 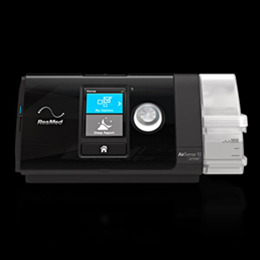 AutoSet Response comfort setting: offers gentler pressure increases and a smoother night’s sleep to help patients with high pressure intolerance. Integrated humidification: simplifies setting up the device and makes therapy easier for your patients. Using AirView™: you can access nightly therapy data, troubleshoot remotely (using the remote assist feature) and change device settings remotely. The user-friendly controls: intuitive interface and color LCD screen make it simple to navigate menus and customize comfort settings. Built-in ambient light sensor: adjusts brightness of the screen based on the light in the room and turns off automatically.